So now the Indian government is planning to launch an all security force attack against the Maoists. Why? Either India can't control the rising pressure from China over the ownership of Arunachal Pradesh and the very old Kashmir issue. 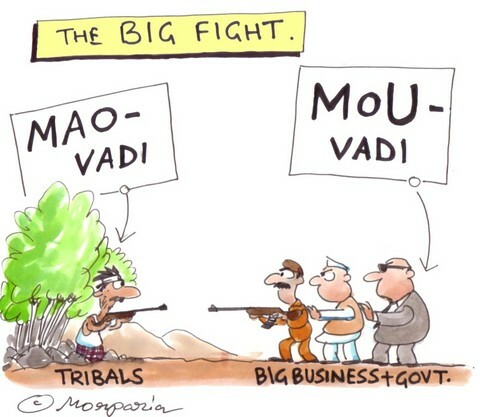 To hide all this from not being the important ones our Home Minister is concentrating on the Maoists. Because they are fighting because the Govt. is going to grab the land from them. india have seen very few fightbacks over evacuation for the construction of dams, the Narmada Bachao Andolan being the prominent. God knows if the Goverment has as promised rehabilitated them,if not,our Govt. would have the stupid excuse that the people were living illegally. When it comes to the evacuation and oppression of the poor all parties are one. The Govt. 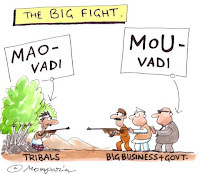 is sure to win the so called war against the Maoists who are fighting the ownership of their land so that a new billionaire doesn't come and invest. Not a single national political party has come in support if the Maoists because they are poor. Here all's right.